Really easy and delicious pork and coriander wontons with black vinegar and chili oil. I have used my favourite Fly By Jing chili crisp oil which you can buy online, although other Chinese chili oils will work too! This recipe makes 60 wontons, I often freeze half of the pork mixture for another day. In a large bowl, combine all wonton ingredients. Place a heaped teaspoon of filling in the centre of a wonton wrapper. brush the edges with a little water and then fold the wrapper onto itself creating a triangle. Then, squeeze out any excess air and seal the edges tightly. Take the two base points and fold them into the centre so they overlap one another. Dab a little water between them to make them stick. Place on a baking tray and repeat with remaining wontons. Bring a large pot of salted water to the boil. Boil wontons in batches for 3 - 4 minutes or until cooked through. Drain in a colander. 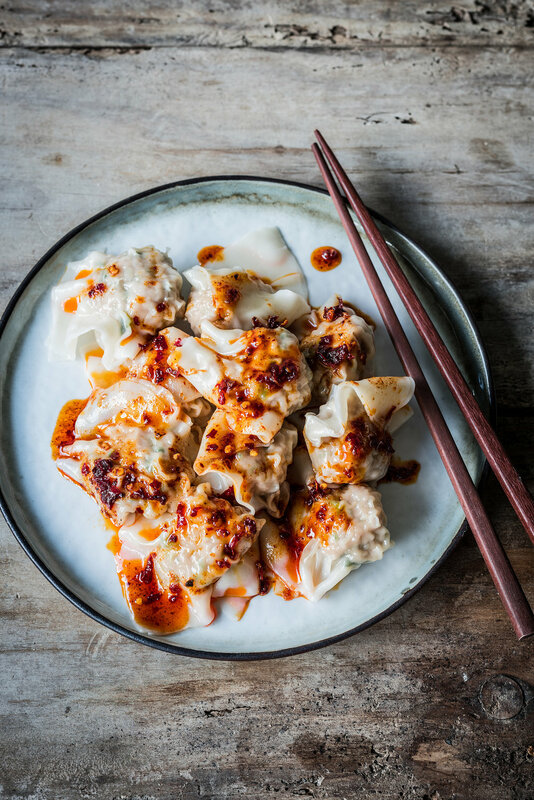 Serve wontons with chilli oil and Chinese black vinegar.